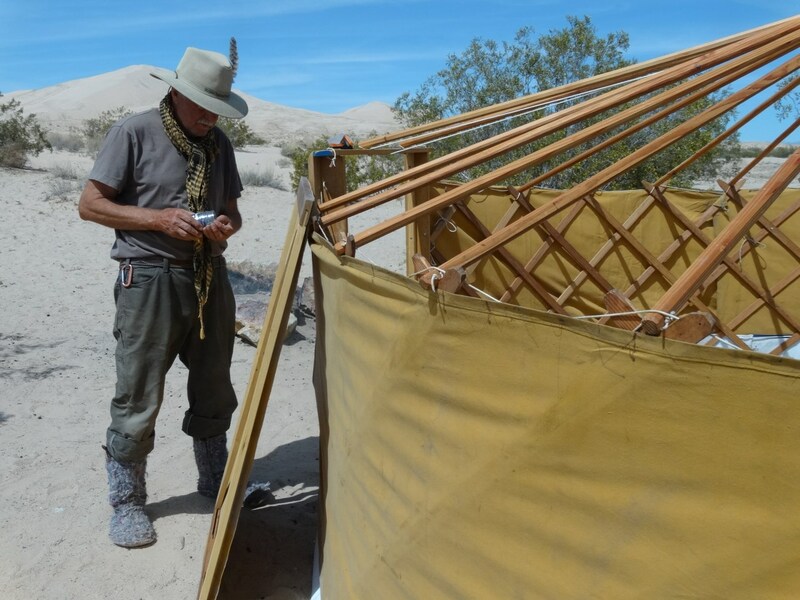 Putting the door on the twelve foot camping yurt at Kelso Dunes in the Mojave Preserve. I've started a new blog titled nomadic life since thematically my experimentation with yurts and tents and other like activities does not seem to fit into the skinboat category. The blog is wolfgangnomadic.blogspot.com if you want to add it to your places to hang out on the internet. Click HERE to go there right now. 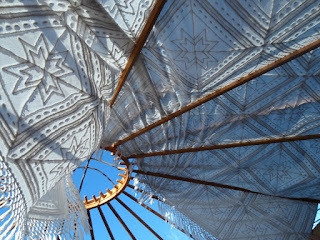 For now the new blog is mostly about yurts, but I am starting to experiment with North African style tents and if I have any thoughts on nomadic lifestyles in general, you will also be able to find them there. Read the first entry if you want to find out why the blog address is wolfgangnomadic and not something more reasonable like nomadiclife or such. No need to have a roof on the yurt most of the time since it hardly ever rains in the desert. A chenille bed spread does very nicely for shade. Glad to see you have a proper hat, but are those boots Muppet skin?